With the failed parts identified, we need a replacement for the FES8DT diodes: 200 V, 8 A, 0.95 V drop, 35 ns recovery time, 125 A surge current. Something more rugged – because already on the datasheet, it says “Ultrafast, rugged” – what do you want more – are the BYV79E-200 diodes. 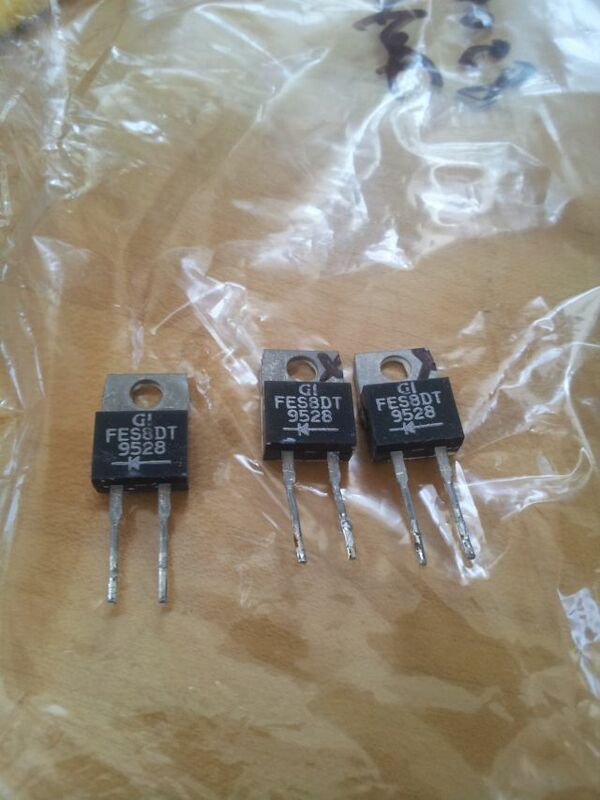 These are 200 V, 14 A, below 0.9 V drop, 30 ns, 150 A. These should last for another 20+ years, and come in the same packaging, SOD59, aka TO220AC. For the 8904A – one important thing! 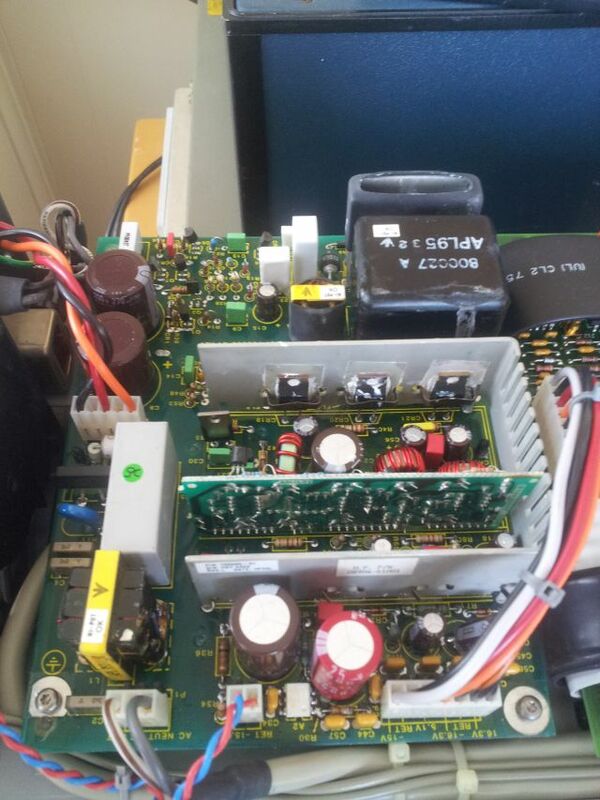 Never short out the RAM backup power on the main board – you will need to go through an activation routine, otherwise, your instrument will be rendered non-working. Don’t now why HPAK didn’t use EEPROM at the time, maybe, these were not yet invented… Following the instructions in the user manual (Thank You, HPAK, for providing all these manuals free of charge on the web!!! ), the backup battery was replaced with a new Lithium cell. In the end, it might be a good idea anyway, to open-up the case every 10 years, get the the dust out, and a new battery in. With new Schottkys, new RAM backup, new serial (and new code), the instrument is now fully functional, option 001 and 002, and will provide good service, hopefully, for decades to come! Anyone with a broken 8904A – feel free to contact me! 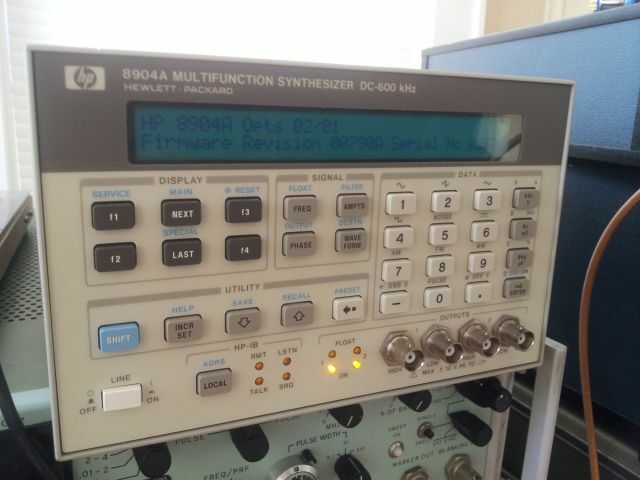 The HPAK 8904A – you will find the detailled specs elsewhere on the web, it is a one-of-its-kind instrument, an early type of arbitrary waveform generator, capable of frequencies up to 600 kHz, but its mainstay is the audio region. Why is it so unique, well, it has a complex (some say, difficult to use, but are there any easier ways?) user interface that let’s you program all kinds of test signals without any time lost for generating complex waveform bit by bit, uploading it to a modern arbitrary generator, and so on. The HPAK 8904A support all the common modulation features, AM, FM, Phase, and additionally, DSBSC (double sideband supressed carrier) and Pulse modulation. It can gernerate FM stereo test signals, various other types of composite signals, DTMF tones, just to name a few. In fact, HPAK has published a catalog, with some of the common waveform (will try some of them later). Most importantly, your plain 8904A might not be able to do all these things, because all the nice and special functionality is only available with option 001, which is, believe it or not, a software option (to my best knowledge, one of the earliest occurrences of a really powerful software option feature for HPAK equipment). The unit I’m using came with option 002, two channels, but not with option 001 – well, it’s software only, all you need is a serial and key, and some intructions – which I will be happy to provide to you, when needed. But before we start: the unit discussed here came from an undisclosed source, and failed power on test (no noise or other signs of functionality). Once opened up, big surprise, HPAK was using a Computer Products switchmode supply, 90 Watts, Model XL51-5601. Fair enough, this is a quality supply, but somethings must have gone wrong – no power. Troubleshooting a switchmode supply, with my somewhat limited workshop here in the US – well, it’s worth a try. No schematic, so hoping that it failed because of one of the more obvious defect modes. 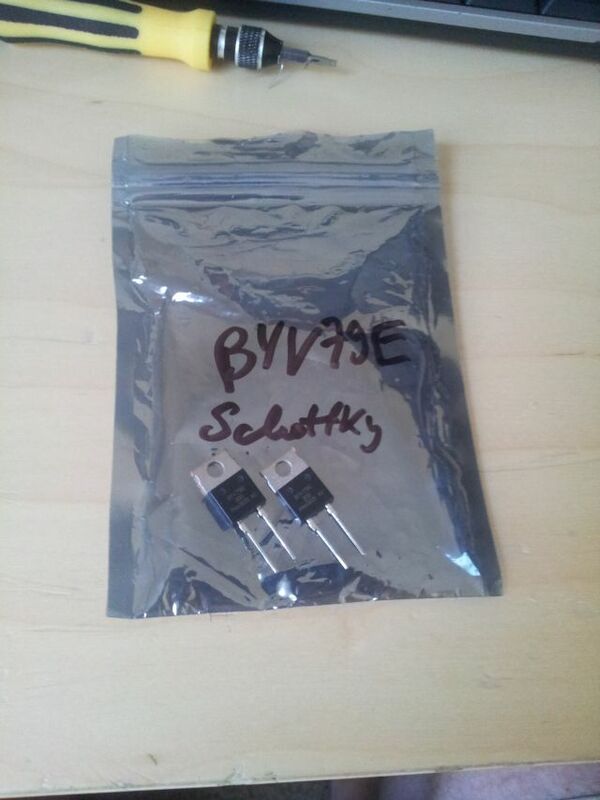 And, fair enough, here are the cuprits: FES8DT Schottky diodes, the secondary rectifiers – 2 of 3 were dead. The FES8DT are 200 V, 8 A, 85 pF, 0.95 V drop devices. 35 ns recovery time. 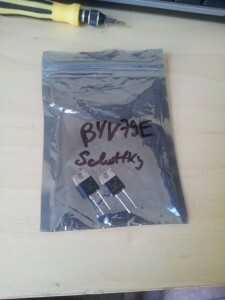 125 A surge current. Seems they don’t fully hold up to the requirements.